MARY-MARGARET McMAHON – AN ORGANIC HOAX by J.J.
There’s an old saying about being ‘careful what you ask for’. This may apply to our Your Ward News’ ANYBODY BUT BUSSIN campaign. We were kind of hoping that the ANYBODY would be SOMEBODY that would preserve and protect the Beaches from interlopers of all type, particularly the builders who have no ties to the Beaches and no qualms about turning our beloved neighborhood into Condo Village. They are already trying to call it the Beach Village so they are half-way there. Mary-Margaret McMahon’s “public” consultations that she dubbed the Visioning Study were like a clever illusion that baffled the audience. The big ‘reveal’ was that Beachers ultimately had no say at all. The trick was prepared out-of-view of the public eye as Mary-Margaret met secretly with supposed “grass-roots” organizations. They were later exposed to be nothing more than ‘astro-turf’ operations which are conjured-up to imitate advocacy. Early indicators that Ward 32 Councilor McMahon was going to sell us out were quite evident, certainly in hindsight. During her 2010 political campaign she hardily slammed incumbent Sandra Bussin for her dealings with Tuggs Inc., George Foulidis’ company. You recall the Boardwalk Pub Caper which resulted in George Foulidis having exclusive vending rights to sell food, beverages and souvenirs throughout the eastern part of the Beaches which includes Woodbine Beach Park. The lucrative twenty-year-deal was approved by city council without opening up the contract to outside bidders. This was despite a recommendation from staff to put it up for tender. That scandal, along with her attempt to sue this paper with taxpayer monies, marked the beginning of the end for Sandra Bussin’s political life in our Beaches. She is very resilient and thick-skinned and we can’t rule out an attempt at a comeback. After Mary-Margaret McMahon’s convincing victory to become Ward 32 Beaches Councilor , Mary-Margaret sang a much different tune regarding the Boardwalk Café/George Foulidis scandal. She actually said,”George has some good ideas, we have some good ideas, and park staff has some good ideas.” She also said, “We have extended the olive branch to Mr. Foulidis.” There may also be some olive oil involved, as it is rumored that George has brought in some ‘Montreal muscle’ to help him ‘take care of business’. A true advocate of the Beaches would have kept developers at bay by demanding that engineers analyze the geological and hydrological factors that make rampant construction in the Beaches a dangerous proposition. Ward 32 News uncovered this scandal when we demanded to know the name of the engineering firm that conducted the all-important hydrological study. This exchange took place at one of Councilor McMahon’s “Visioning” sessions that were designed to blind Beachers from the truth that the fix was in. Needless to say, there was no such study. There was no engineering firm and no comment from Councilor McMahon. On Election Day we need to be at the polls to unseat Mary-Margaret McMahon who has clearly sold us out. Why should anyone be surprised? She fluked her way into office just like in the movie ‘Mr. Smith Goes to Washington’. The big difference is that Mr. Smith (Jimmy Stewart) had integrity, unlike our present councilor who is devoid of such. 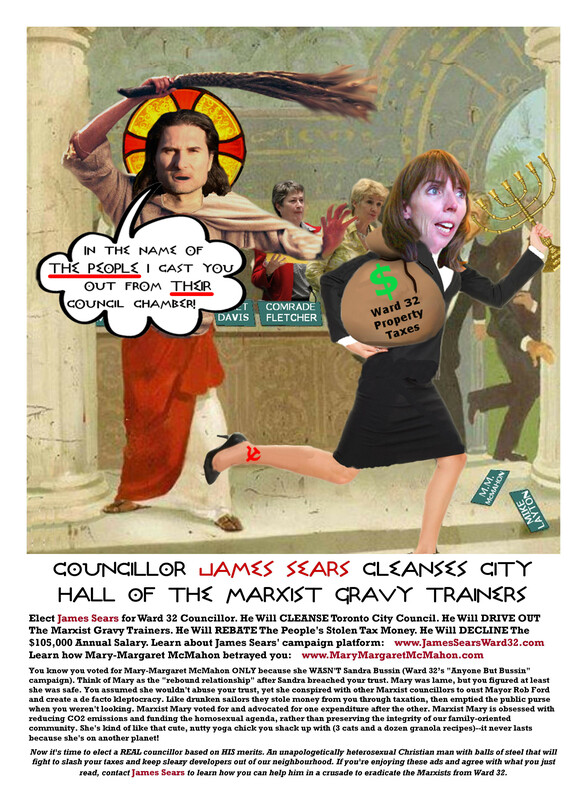 Between her co-operation with the oily George Foulidis and her conspiring with amoral developers, Councilor McMahon must be swept in to the ‘dustbin of history.’ The broom is in YOUR hands. It’s time to clean up the Beaches. UN-ELECT MARY-MARGARET MCMAHON!!! A TRULY ORGANIC HOAX!!! Wonder why most of the crooksters are females? Not meaning to be a “misogynist”, but everyone has a right to know why most of the puppets in these scandals are women, most of whom are left leaning Marxists? feminimarxism portrays privileged women as the victims, but when REAL MEN like James Sears spreads the truth, he ends up as a Marxist NWO police suspect and potential criminal for his anti-establishment views.